As is usual in our home, the day started out quite normally. But those of you who know Sally, also know this can only mean ‘something’ is coming. In Sally’s patented roundabout way. Sally’s and my school was hosting a bake sale. Proceeds to be used to buy a pair of goats for a little village somewhere in Nigeria. So Mom and I were baking up the proverbial storm. Cakes, cookies, squares. All in a charitable effort to provide . . . charity. Initially, Sally had been helping. Then we asked her to do something else. Because . . . reasons. Also . . . Sally. I’m assuming she retired to the front room because shortly after she left us, the TV began to blare at about 150 decibels. Clash of the Titans. I’d know it anywhere. Frowning sharply, Mom had raised her sticky hands into the air and marched in there. As the sound was almost instantly halved and Mom returned still with sticky hands but minus the frown, I assume she had successfully curbed Sally’s nine-or-nothing impulse to volume control. Peace was restored and everyone was happy. Some 90 minutes later, Mom and I had managed to bake—and frost—some four cakes, 14 dozen cookies and three large sheets of squares. I was in the process of wrapping up those things deemed cool enough to . . . erm . . . wrap up. Mom was mixing yet another batch of brownies. Then, from the front room, we heard the scrape of chair legs, followed almost immediately by thumping and the sounds of battle. All right, yes, the sounds of men and hardware were purportedly coming from the television, but there were enough local reverberations to convince both Mom and me that the movie battle currently broadcasting wasn’t confined to the screen. “Should I . . .” Mom started to say. And, also from the front room, a huge thump, then a moment of silence. For those of us in the kitchen, it quickly became all too apparent what that tiny moment of silence actually meant, as something long and pointy flew into the kitchen in a great, graceful arch, neatly snagging one of the two ‘iffy’ legs on the laden table. I probably don’t need to elucidate vis-à-vis said legs because those of you who know Sally, would also know why we have a lame table. For a moment, the table teetered on two sound and two less-sound legs. Instinctively, I dove for it, but misgauged my trajectory and managed—rather than to right it as had been my intention—to push it to its ultimate doom. The weakened legs folded like wilted lettuce. Packages of baking slid to the floor in an unhurried, sweet-smelling avalanche. Mom and I stared at the heap. Then, as one, turned to stare at the architect of our doom. A pitchfork, still with one of the table legs clutched in its tines, lay on the far side of the kitchen, its innocent, supine position belying its former destructive-ness. Uh-oh. Mom almost swore. Mom never almost swears. A journey someplace far away was indicated. Sally disappeared. Mom was two steps behind her. I started to pick up packages. P.S. Most of the baking survived the ‘clash’. Each month, Karen's followers exchange words. 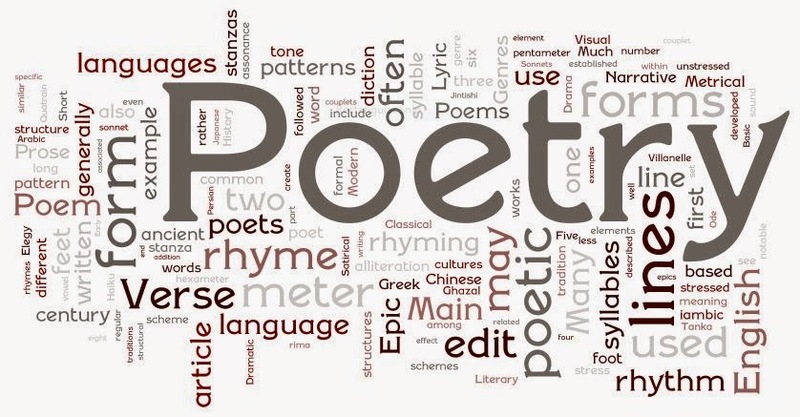 Now hop over and see what the others have done with their words! Labels: More Sally. Use Your Words. 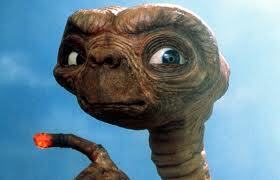 Our family was watching ET. Again. They don't do this anymore, but in times past, every step to the opening of a movie served to heighten the anticipation to a fever pitch. You cannot argue with results—spectacularly . . . sufficient. And best of all it takes so little energy from me! But one thing that is certain is we all are having fun! Hop over and see what the others have done with this month's theme: Cleaning Out the Fridge! Labels: It's easy! 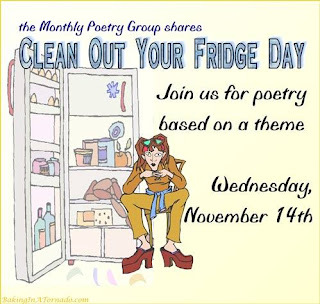 Cleaningoutthefridge, MonthlyPoetrychallenge. Let’s just say that ‘gambler’ wasn’t in the cards for him. It was game night at the Tolleys. Something that happened . . . often. The night’s game of choice? Spoons. A fairly uncomplicated game ideal for the large family. One reduces the deck of cards to one set of four for each person playing. Thus, if eight of you are playing, the deck consists of eight sets of four cards. Or 32. 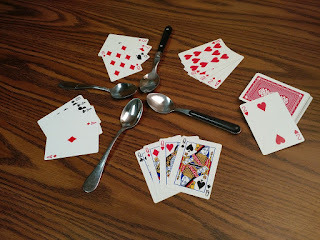 Oh, and there are spoons in the middle of the table (hence, the name) numbering one less than the persons playing. Why this is so will become clear. The cards are shuffled and dealt. Four to a player. The idea is to then pass them one at a time (and in unison) to whoever is seated to your left, keeping only those cards you wish to ‘collect’. The goal is to be the first to get all four cards the same. And to then grab one of the spoons placed temptingly in the center of the table. As soon as that first player grabs a spoon, everyone else at the table then does likewise, trying to not be the one who misses out. A-ha! Now the reason for the one less spoon become apparent. Because the person who doesn't manage to grab a spoon receives a letter. In our family, the letters received eventually spelled out ‘horse’. And woe be unto anyone who collected all five. Because you were then ‘out’. No one in our household ever achieved that landmark. And now on to my story. You must have realized that all this was leading somewhere . . .
Sooo . . . game night. Middle son, Duffy, was getting into the game. He had already collected a couple of letters and was trying his best to not further his losing streak. And a letter was ‘rewarded’. There was some laughter and the spoons were replaced and the cards re-shuffled. Then eldest daughter suddenly pointed to the center of the table. “There’s one spoon missing!” she said. True enough. There were only six when there should have been seven. A short search was initiated. Duffy pointed across the table. “You should probably lo . . .” That was as far as he got. Because the missing spoon slid out of his sleeve to land with an incriminating little ‘click’ on the polished tabletop. Remember that part where I predicted he’d never become a gambler? Labels: Or the worst of the best., yeah it wasn't in the cards! And ice encased our little town. Cause it was just September twelfth! Though that is how they really felt! We hadn’t finished summer yet! Trust me, by then I was beat! Felt that I drove a curling rock. I tell you, it was quite a chore. I hurried just to get ‘inside’! My fingers and my nose were blue! I’d just walked into paradise! I’d finally found my ‘someplace warm’! To talk about the things we build!